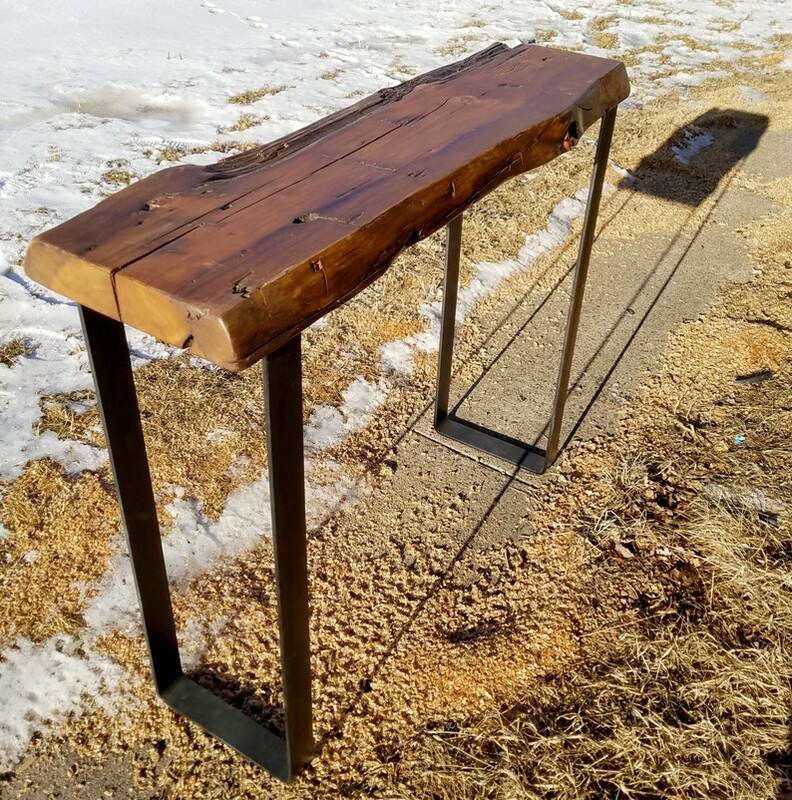 Reclaimed wood console table with contemporary steel legs made from authentic, hand-hewn, salvaged wood from log cabins and barns in the upper Midwest. These functional pieces can be used as sofa tables, sideboard tables, hall tables, wine servers or coffee bars. Order with short legs and make it a coffee table. 2) Choose your table height from the drop down menu. Read more about the different leg height below. We use a very tough, low VOC, non toxic Enduro-Var that binds the wood fibers. I mix my own dyes to tint the wood. The standard finish depicted in the primary photo is called vintage maple, which plays beautifully with the natural variations of the wood. Other shades are also available (see photos for color chart) and I am happy to custom mix a shade to work with your own furnishings, floors, woodwork etc... Please inquire if interested. The legs will ship unattached. Hardware is included and holes are pre-drilled. Quick assembly with a phillips screwdriver. It looks great, way better than the alternative. This review has been a long time coming! We actually received our package right on time, but we had to leave it in the box as we were in the middle of an unexpected cross-country move. It wasnt until last weekend that we finally unpacked it and put it together and... W.0.W. The pure character of the wood was entirely preserved while being accented by a beautiful finish and legs. Sometimes the most simple things in life are the most beautiful, and this is no exception. Absolutely gorgeous work.